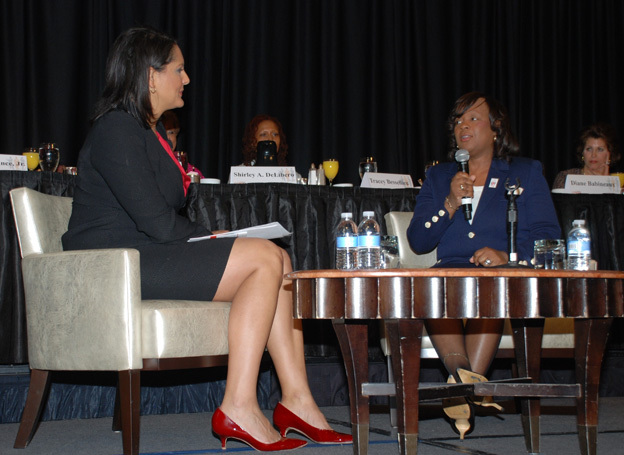 IAM General Vice President Diane Babineaux, recipient of the 2014 “Women Who Move the Nation” award, sits down with MSNBC Disrupt host Karen Finney at the Conference of Minority Transportation Officials award ceremony in Washington, DC. “Women Move the Nation” was the theme of the third annual awards ceremony hosted by the Conference of Minority Transportation Officials (COMTO) in Washington, DC. In observance of Women’s History Month, COMTO honored 10 women who have made extraordinary contributions to the transportation industry. Recipients of the 2014 “Women Who Move the Nation” awards represented a broad cross-section of transportation in both the private and public sectors – including aviation, highways, public transportation, advocacy and labor. IAM General Vice President Diane Babineaux was among this year’s recipients. When asked by MSNBC Disrupt host Karen Finney what advice she would give to other women working to excel in a male-dominated industry such as labor, Babineaux stressed the importance of growth and mentorship. Other honorees included women of academia, state and U.S. government. Civil rights activist Rev. Jesse Jackson served as keynote speaker. Former U.S. Transportation Secretary Norman Mineta was also in attendance.